ATLANTIC OCEAN - Divers in the Atlantic Ocean, supported by a paranormal research group, re-explored the wreck of the Titanic Saturday, according to UnNews sources. The divers brought down with them paranormal activity detection devices designed to monitor low frequencies, and any activity that might indicate the presence of ghosts, in order to record and measure them. Traces of paranormal activity could be found all over the ship, but to everyone's surprise, the most paranormally active area of the ship was its cockpit. On tapes recovered, ghostly voices could be heard first, spotting the iceburg, then arguing for six hours over the direction in which to turn the wheel. At one point, some of the voices heard over the recording insisted they were time travellers from the future in the cockpit, demanding that they be allowed to take the wheel and trying to seize control of the wheel. 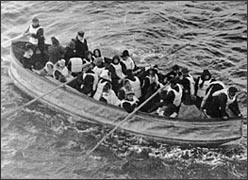 The crew of the Titanic argued with the time travellers first, that they did not believe they were from the future, and second, that they were not crew of the Titanic and were not authorized to navigate the ship. The final three hours of the recording were arguments with the time travellers about control of the ship's wheel, and the last hour was full of arguments about who should get the lifeboats. This page was last edited on 3 April 2019, at 11:27.